The first article I did on PE's disappearing beaches opened up some interesting questions around the re-activation of the Noordhoek dune field, and how this might help get some sand back onto the town beaches. I went and did some digging (well, googling) and found some old beach reports & other interesting stuff. I've laid the article out like a Q&A cos it just makes easier reading, but it's just me answering my own questions! 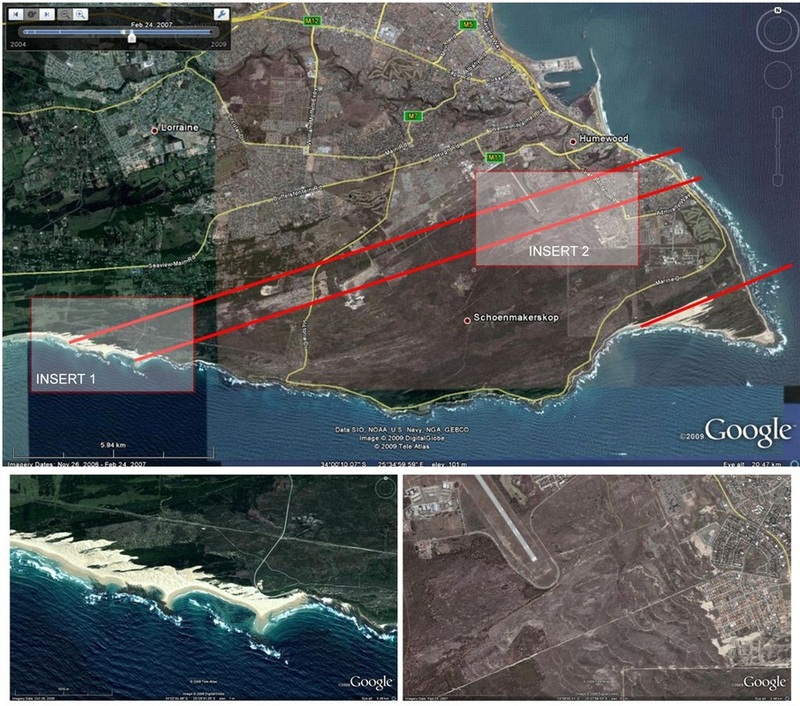 So what is the Noordhoek Dune Re-activation project all about. The Noordhoek dune field is in Cape Recife. The natural path of the sand is to blow from the wild side, across the Cape Recife headland, and towards the bay. It’s a fairly narrow dunefield, only about 500m across. It’ll most likely enter the bay just south of SAMREC in Cape Recife. When the sewerage maturation ponds where built in Cape Recife back in the 1960’s, they fell into the path of the moving dune field, so the leading edge of the dunes were stabilized by planting vegetation. The re-activation of the dune fields would essentially entail stopping the prevention of the natural flow of sand through this stabilization, and let it revert to just following its course. Removing the stabilizing vegetation would speed things up even further. In time this would see the Noordhoek dunefield cut right across Cape Recife as it did in the past and feed sand back into the top of Algoa Bay. It’s anticipated that it would add 15% to the current sand volume entering the bay. This would go a long way in helping to replenish the town’s beaches, as it would become a regular supply of feeder sand. Sand fed into the sea from the dunes would drift down towards the Bay’s beaches due to the natural longshore current that sweeps from the tip of Cape Recife into the bay. Are there any potential negative consequences of reactivating the dunes? Over time the dunes would cover the settling ponds at the sewerage works. This wouldn’t happen overnight though; it may take a few years at least. It would most likely also only affect the ponds, not the main infrastructure of the sewerage works. Obviously there’d be some cost implications to move the ponds, but the municipality would still have a few years to find the budget to move them out the way before the dunes reach them. If a way was found to utilize all the grey water produced by the sewerage works, for example using it to water the golf course and the parklands along the beach, then there wouldn’t probably even be a need for the ponds. At this stage they just store the treated water whilst it’s waiting to get used. How long would the dunes take to reach the bay if left to their own devices? It's estimated that it'll take the dunes about 55 years to reach the beach. At the moment they're about 1km away, moving at a rate of around 16m a year. This assumption is based on comparison of aerial photographs taken in 2004 and 2007. If an active effort was made to clear a path for them, and remove the stabilizing vegetation at the leading edge of the dune field, then it might speed things up a fair bit. Once the dunes reach the bay, would it have a fairly immediate effect on replenishing the sand along our beaches, or would that process take quite a while? The prevailing sea conditions would determine how quickly the sand would build up, as if there’re any large storm events it will strip the sand off the beaches. But it’s assumed the effects would be pretty immediate. Has the sand loss been a recent occurrence, or is it something PE’s battled with since development began along the eastern stretch of the bay back in the day? During the first half of the 20th century all the beaches from the harbor to Cape Recife were sandy. However, a report by the Institute for Coastal Research at UPE in 1985 showed that all the beaches except Kings were showing marked erosion. Historically the Cape Recife area was characterized by 3 main driftsand areas, known as Driftsands, Noordhoek and Cape Recife. These mobile dune systems were separated by naturally stable vegetated dunes. To avoid the developing residential area from becoming inundated with sand, both Driftsands and Noordhoek, the 2 largest dune systems, were substantially reclaimed from around the 1970’s. Research showed that the predominant source of sand for the beaches along the Cape Recife to harbor stretch was from these 3 dune fields. 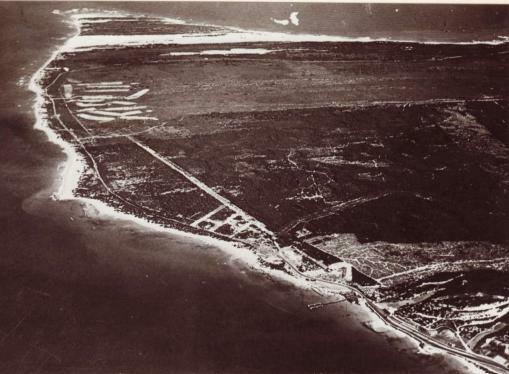 Before the reclamation of Driftsands, the bay used to get around 170 000m3 of sand a year from the dune systems. Driftsands is actually the dune system that starts in Sardinia Bay, and in those days used to track over the peninsula, right past where the airport is today, and empty into the sea between Happy Valley and Bird Rock. There’s historical evidence of its existence long before the first settlements in the area. After Driftsands was reclaimed, the sand entering the bay from the remaining 2 dune systems dropped to around 78 000m3/yr. 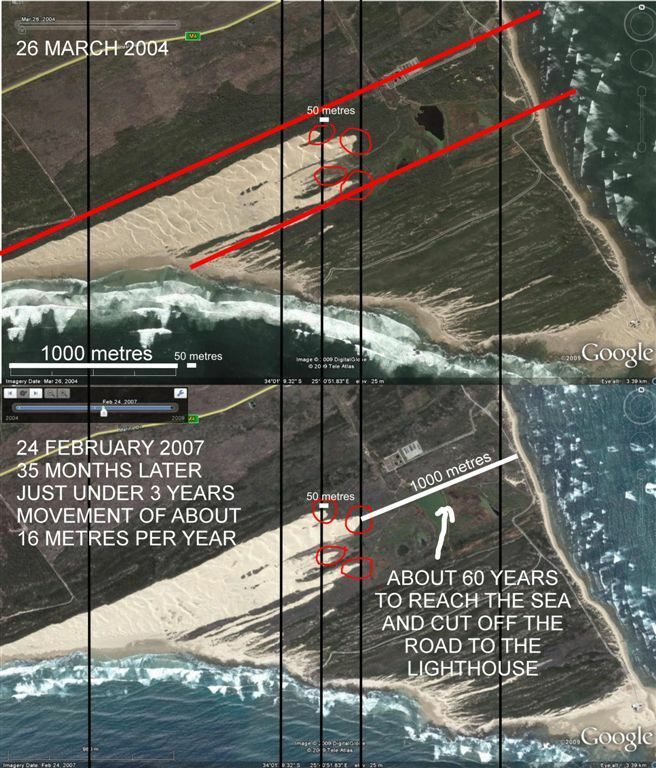 Then in the early ‘70’s, after Noordhoek was also reclaimed, it dropped even further to only 26 000m3/yr, which was coming from the small dune field at the lighthouse at Cape Recife. That’s a 75% decrease in the amount of feeder sand our beaches are receiving. Little wonder they disappearing! Comparison btw 2004 and 2007, showing a 16m growth of the dune field. Image courtesy Glendore Sand. What else does the research say? A study back in 1984 already showed that from then already all the beaches from the south end of Kings Beach were in a net state of erosion, and that the reservoir of sand held in the foredunes system (i.e. dunes right on the beach) was being depleted. Given that dunes will still take quite a while to reach the bay, what can be done to save the beaches as an interim measure? Stabilising the fore dunes we have along the beach currently will help reduce the sand loss that results from the onshores. At Pipe for example, what happens over time is that the easterlies will blow sand up the beach, where is accumulates against the boardwalk. This then blows onto the boardwalk, and then over into the car park or grassy areas, and is thus lost to the beach system permanently. The sandbags that have just been placed at Pipe are to try keep the sand on the beach, with the green netting fence that'll be put up serving the same purpose. Just trying to stop sand getting blown into the car park and lost. Ideally it would be even better to stabilize i.e. vegetate, the dune system - as this will be the best way to trap the sand on the beach, meaning we reduce the overall rate of erosion. The challenge is to ensure that people respect the reclaimed area and don’t walk through it, as this destroys the plants and affects the success of the sand entrapment. So why haven't we planted the dunes yet? Plants cost money, and cost money to plant and look after. These also require watering, which is challenging due to the current drought conditions. Plus you’ve got to get the communities buy-in, to educate them so that they don’t go traipsing all over dunes! But hey, if we've gone and plonked sand bags up anyway, don't see why we can't go plant some stuff too - and how about using the grey water from the sewerage works in Cape Recife? Kill 2 birds with 1 stone - use the water that currently has to be stored in the maturation ponds which are in the way of the dunes. Thus a use is found for the water, so it doesn't need to go to the ponds anymore, meaning the Noordhoek dune field can just move on straight over them! What about using the sand dredged from the harbor? We’ll cover that in our next article! Watch this space! Too much on the wildside, too little in the Bay! Ironically Sards is suffering from too much sand. Well, let’s classify that a bit more. Sand got shoved back to make way for roads and amenities that we’re now accustomed to at the Sards beach. Problem is, sand doesn’t respond well to being held back and is relentlessly trying to make its way back along its original track. This has seen the road and ablution blocks totally covered and Sards beach essentially cut off. 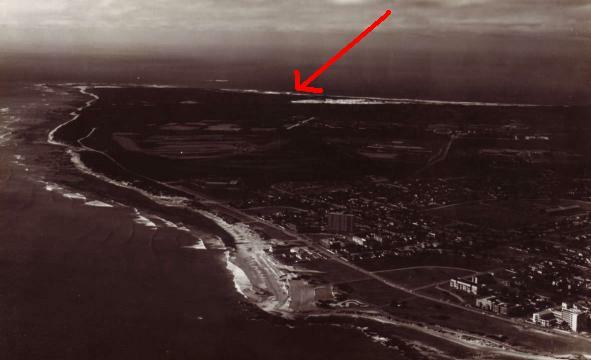 Interestingly, if you check out the old map at the beginning of my article, you’ll see that the Driftsand dune system which ran through Summerstrand and Humewood and supplied all the sand into Algoa Bay actually has the Sards beach as its start point! But shew, the consequences of letting that dune field return to normal would be pretty challenging! Although the possibility of Millers becoming a right sand point might be worth it!! If the Sards dunes were allowed to have their own way, this is where they'd end up again. Just like it was back in the 1800's. Thanks to Glendore Sand for permission to use pictures from their website. 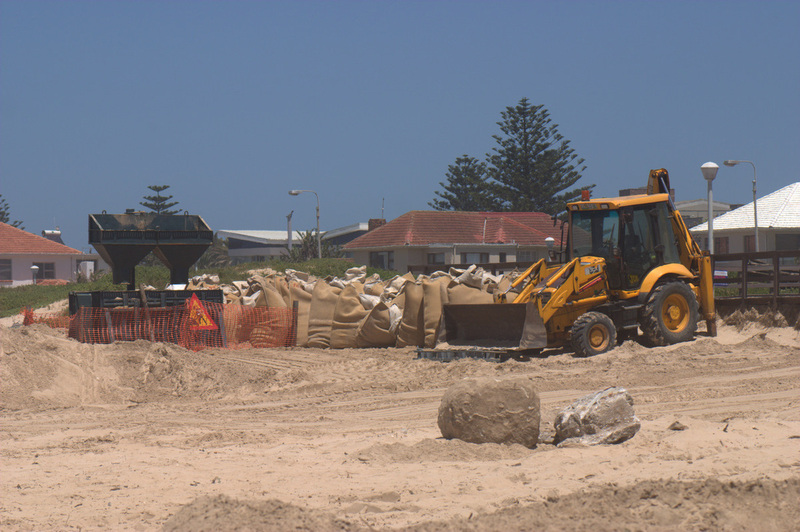 Glendore is assisting the municipality in trying to resolve the sand issue at Sards. Check out the first article on PE's disappearing beaches here.